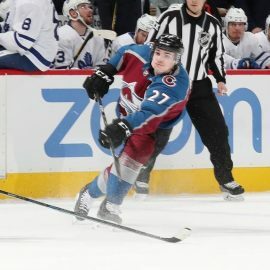 Ryan Graves was acquired by the Colorado Avalanche from the New York Rangers via a trade on Feb. 26, 2018 and played for the Avs’ American Hockey League affiliates, the San Antonio Rampage and Colorado Eagles, before making his NHL debut this season on Dec. 27 at the Vegas Golden Knights. The Yarmouth, Nova Scotia, native tallied his first career NHL goal on Jan. 4 against the New York Rangers and followed the performance up with another marker in his very next outing on Jan. 8 at the Winnipeg Jets. The 23-year-old defenseman has earned his way onto the Avs’ roster and has three goals and two assists in 21 NHL games this season. Graves discusses with ColoradoAvalanche.com about adjusting to the organization, playing in the NHL and his favorite off-the-ice activity. What are the style differences you’ve seen between the AHL and NHL? How special was scoring your first NHL goal? Since that first goal, you’ve scored a few more, have you gotten used to scoring in the NHL? How did you like your time playing for the Eagles this season? What has your transition into the Avalanche organization been like? What are your hobbies off the ice?